Gampo Abbey is happy to announce the ordination of a new life monastic! On Feburary 1st Samten Trinkar, one of Gampo Abbey’s residents, took the brave leap of accepting Parma Rabjung ordination. This is the first step on the path of life ordination in Gampo Abbey’s tradition, an entry period before requesting Getsul (novice) vows. Samten had initially encountered Buddhism through an improv jazz workshop she took at the Halifax Jazz Festival. Her teacher, Jerry Granelli, was an early student of the Vidyadhara, Choygam Trungpa Rinpoche. Samten said Granelli “brought the dharma to everything.” The class started the workshop with meditation and worked with their neurosis to create and explore making music. 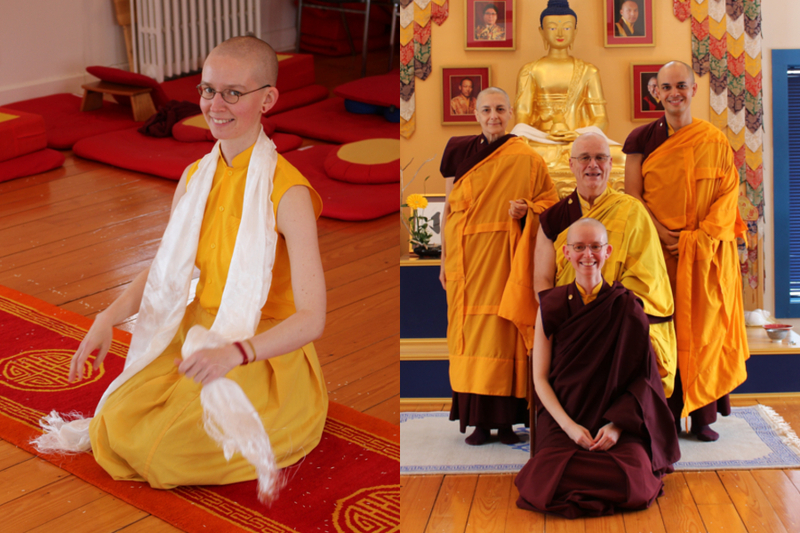 Samten first came to the Abbey when she was a music student at St. Francis Xavier University in Antigonish. She participated in a religious study course where a group of students live and work alongside monastics at the Abbey for a week and learn about mediation and Abbey life. It was at St. F.X. where she also took her first Shambhala class, Level 1, with Shastri Alice Haspray (who later became the Shastri-in-Residence at the Abbey). Samten’s attraction to monasticism persisted, and she came back and was ordained as a temporary monastic in 2014. She stayed for about a year and then left to explore life outside the monastery. She became a staple of the Dorje Demna Ling staff, pursued college, and explored a relationship. When the opportunity arose for her to come back in 2017 to work in the kitchen at Sopa Choling and participate in the Warriors Who Are Fearless temporary residency, she jumped at the chance. 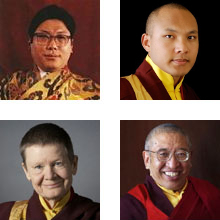 Her experience living away from the monastery completely confirmed her commitment to monasticism as her personal path. In January she made her formal request to the Abbey’s senior monastics for Parma Rabjung ordination. Her acceptance delighted everyone at the Abbey. On the day of her ordination she was glowing and exuding boundless happiness like a perky lion! She will continue to use her refuge name, Samten Trinkar, until she requests Getsul ordination and receives a monastic name from Gampo Abbey’s abbot, Thrangu Rinpoche. Please join us in welcoming Samten. Ki Ki So So! I am so happy for Samten. What a meaningful decision and joyful addition to Gampo Abbey. Congratulations Samten! You were already in 2014-15 one of the best monastics! May the Abbey and the wider world be enriched. Dear Samten, your smile speaks volumes, I’m so delighted and happy for you, Congratulations! My vast good wishes go out to Samten, and to Gampo Abbey, that this courageous step will serve to fulfill the most excellent aspirations of all warriors. Love reading this and seeing the pictures. Brings back fond memories of the time spent there with other retreatants for 10-day retreat in 2017!